The longtime U.S. swimming star has been banned from competition until July 2019, which means the 12-time Olympic medallist cannot compete as planned in the national championships that start this week in California. 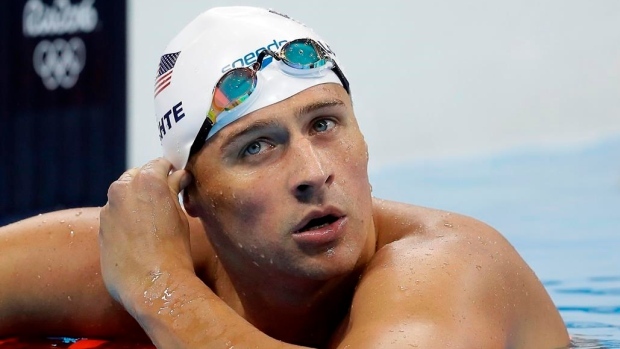 Lochte will also be ineligible for other top meets, including the Pan Pacific Championships later this year and next year's world championships. Lochte's offence was that he got an intravenous injection in May — a method typically banned under anti-doping rules. The 14-month ban, retroactive to May 24 and announced Monday by USADA, is his second in less than two years following his 10-month suspension for his behaviour during a drunken incident that created widespread scorn at the 2016 Rio de Janeiro Olympics. In Brazil, he said there were questions about his version of what happened. Lochte's violation essentially came to light when he posted the photo of him getting the IV on his social media accounts. That triggered the USADA investigation, one that Lochte "fully co-operated" with according to U.S. officials. Lochte spent much of his career portraying a party-boy image, while his wildly successful exploits in the pool — six Olympic golds, 36 world championship gold medals, no fewer than four world records — were always overshadowed by 28-time Olympic medallist and 23-time Olympic champion Michael Phelps.